Ubiratan Libanio Dantas de Araujo. Since 1985 He has been selected in Humor Contests in Brasil as Piauí, Belo Horizonte/Caratinga (MG), Santo André/Ribeirão/Araras/Piracicaba (SP), UNACON (Brasília), Carioca Humor Contest and Volta Redonda (RJ), Porto Alegre/Lageado/Univates (RS), Pernambuco (FIHQ-PE). He has been selected in International Contests of Cartoons as "ParaRAIL world", from Rússia and "II Rencontre du Dessin de Presse" Carquefou, France. 2002-Merit Diplom (Zumbi dos Palmares) from Municipal Chamber of Campinas (São Paulo). -First prize (caricature) at Ramiz Gökçe Cartoon Festival (Cyprus), Angelo Agostini Prize as brazilian best cartoonist. 2004- Special prize at Volta Redonda´s Humor Contest. 2005: Speaker in the World Comics Conference (South Korea). 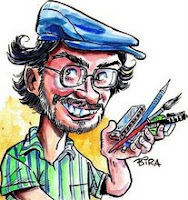 2005: Angelo Agostini Prize as Best Brazilian Cartoonist. 2007: HQmix prize by coletive Comics book Front (Via Lettera publisher). 2008: HQmix prize Quarto Mundo.